The defensive gun emplacement at Point Nepean can lay claim to firing the first shot of all the British allied forces during World War I. Although England declared war on Germany at 11 pm in London on 4 August 1914, owing to the difference in standard time, this was not announced in Australia until 12.30 pm on 5 August by Mr Cook, our Prime Minister at that time. At that moment, the German freighter “Pfalz” (outbound from Melbourne) hove-to off Point Nepean to have her papers checked. Being found in order, she was given clearance to resume her voyage to sea under the guidance of an Australian pilot. At 12.45 pm, however, the declaration of war was flashed to Point Nepean and before the ship could reach the entrance, a shot was fired across her bows as an order to return to port. The “Pfalz” then anchored off Portsea, the master and crew were interned, and the ship was renamed HMAT Boorara and became a troop carrier. Navy's involvement with the 'first shot' surrounded the actions of MIDN Stan Veale RANVR onboard the Examination Steamer ALVINA who at around the same time, having read part of a flashing light signal from Fort Queenscliff that War had been Declared, raised the International Signal Pennant ROMEO to 'Bring To' the vessel Pfalz. Those on ALVINA incorrectly believed that the shot fired from Fort Nepean across the bows of the Pfalz had been in compliance with their Flag ROMEO signal. Commemoration: A re-enactment will occur at Point Nepean on 5 August 2014 . Navy's involvement is likely to include provision the Melbourne Detachment of the RAN Band and some Signalmen from HMAS Cerberus. 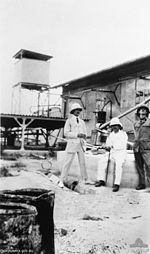 The Australian Naval and Military Expeditionary Force (AN&MEF) was a small volunteer force of approximately 2,000 men, raised in Australia shortly after the outbreak of the First World War to seize and destroy German wireless stations in German New Guinea in the south-west Pacific. Britain required the German wireless installations to be destroyed because they were used by Vice-Admiral von Spee's German East Asian Cruiser Squadron, which threatened merchant shipping in the region. Following the capture of German possessions in the region, the AN&MEF provided occupation forces for the duration of the war. 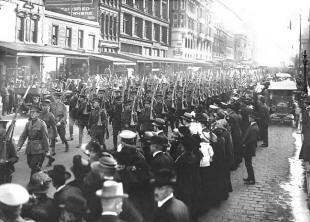 The Victorian contingent departed by rail from Melbourne in August 1914. Commemoration: A re-enactment at either the Flinders or Spencer Street railway stations is being planned by the Victorian Government. Australia’s first land battle of World War I occurred at Bita Paka near Simpsonhafen (now Rabaul Harbour) in New Britain on 11 September 1914. 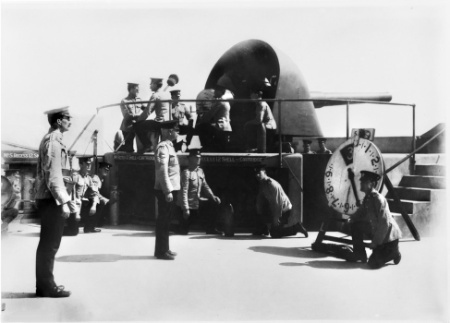 Acting on the British Admiralty’s orders to destroy Germany’s all-important radio stations scattered throughout their Pacific Territories, a joint Australian Naval and Military Expedition Force (AN&MEF), consisting of 1000 infantry men and 500 Naval reservists, was hastily assembled in August 1914. 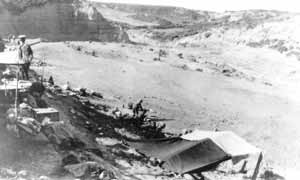 Transported to the target in HMAS Berrima, a raiding party of nearly 100 Army & Navy personnel was landed at Kabakaul from whence they made good their attack on the German Administrator’s Headquarters and radio station at Bita Paka. The first Australian casualty in World War I was killed in this raid. AB Billy Williams aged 29, from Northcote Victoria, had worked at the Melbourne City Council Electricity Supply Depot in Spencer Street prior to enlistment. In total, 6 Australians were killed. The Cerberus museum has the original German flag which was hauled down from the Administrator’s office that day. Commemoration: A commemorative service will be held at the Shrine of Remembrance. 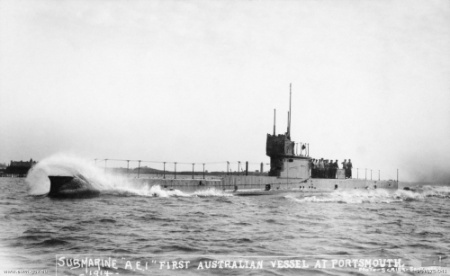 On 14 September 1914, the Australian Submarine HMAS AE1 was on patrol with HMAS Parramatta off Cape Gazelle. The last known contact with AE1 was at 1430 on 14 September 1914 when the submarine signalled to HMAS Parramatta “What is the distance of visibility?” The submarine was not heard from again and to this day her wreckage has not been found. The circumstances surrounding the disappearance of the submarine are unknown, however it is noted that the weather was quite hazy and visibility poor on the day of her disappearance. 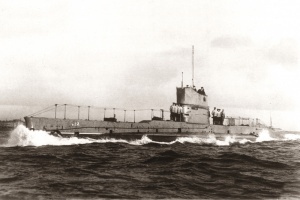 Her crew of 35 British and Australian submariners are presumed to have perished. Commemoration: A memorial service at the Shrine of Remembrance is being planned by the RAN Submarine Association. At about 2.30 pm that day at Port Melbourne, the Governor-General of Australia, Sir Ronald Munro-Ferguson, accompanied by his wife and official party, boarded His Majesty’s Australian Transport (HMAT) Ship No 3, Orvieto to farewell Australian troops and the Commander of the First Australian Division (Sir William Throsby Bridges) departing for war. A short while later, after the Governor-General and his party left the ship, the Orvieto, along with 16 other troop ships, began to depart. The band of the 5th Battalion played the National Anthem and crowds on the pier watched in delight as the soldiers on board stood to attention. Commemoration: A re-enactment in Port Melbourne is being planned by the Victorian Government. 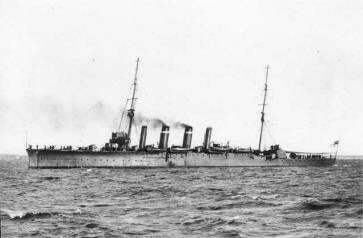 On 09 November 1914, HMAS Sydney (escorting the fleet of Troop Ships carrying the first deployment of AIF and New Zealand Army personnel and horses to the Middle East) received a distress call from wireless telegraphy station at Cocos Island. As the closest ship to the Cocos, Sydney was ordered to investigate. The German Cruiser S.M.S. Emden had anchored and sent a landing party ashore to destroy the wireless station. On Sydney’s approach the Emden fired and an intense battle followed. Once Emden had run aground and was incapable of moving, Sydney pursued another German vessel, the Buresk, which had stayed clear of the battle. A boarding party was sent aboard the Buresk to detain the crew, however the ship had already begun to sink; the boarding party and crew were recovered and the Buresk was fired upon 4 times to ensure that she sank. Sydney then returned to Emden and, after the German crew surrendered, Sydney assisted with the transport and care of the German wounded before continuing to Colombo. Commemoration: HMAS Cerberus is likely to host a “Sydney/Emden Mess Dinner” to commemorate this event. As a diversionary tactic for the planned Allied troop landings at Gallipoli on the morning of 25 April 1915, AE2 had earlier (that morning) successfully broken through the heavy fortifications along the waterway called the Dardanelles (she was the first Allied submarine to succeed in this mission). After a number of battles and near misses, AE2 then proceeded (in accordance with her instructions) to “run amok” in the Sea of Mamara in an attempt to prevent enemy shipping harassing the Allied landing force and the resupply of the Turks on the Gallipoli Peninsula. At 9 pm that evening, the CO (LCDR Henry Stoker) sent a signal which informed the Fleet Commander of AE2’s success. This provided much needed good news to General Sir Ian Hamilton, the commander of the Mediterranean Expeditionary Force (MEF) which was meeting stiff opposition at Gallipoli. For the next 4 days, AE2 continued to harass enemy shipping but after being heavily shot up by the Turkish gunboat Sultan Hissar, Stoker was forced to scuttle AE2 at 10.45 am on 30 April 1915 and abandon ship. 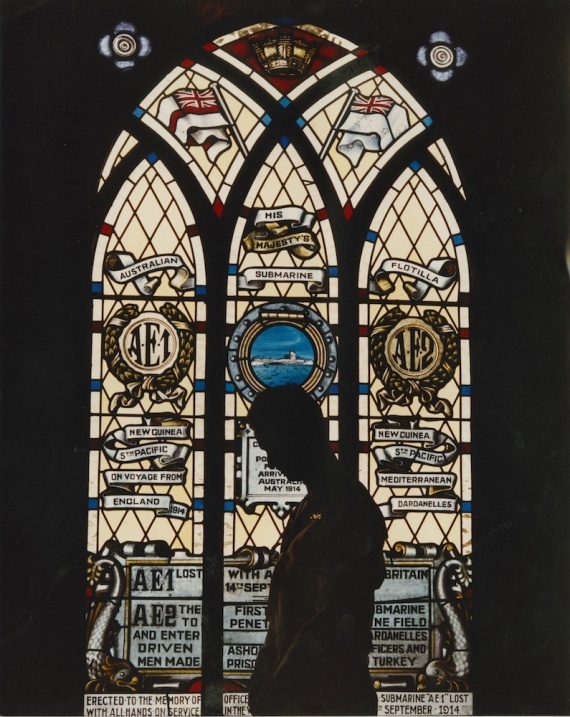 Commemoration: A commemorative service in recognition of the loss of the AE2 and four of her crew whilst POWs is being considered. The RAN Bridging Train (RANBT) which was assembled in February 1915 and trained in the Domain, where Melbourne’s Shrine of Remembrance now stands, was the last Australian contingent of military personnel to leave the shores of Gallipoli. At 0430 on 20 December 1915, after building the necessary piers and pontoons for the last of our soldiers to evacuate onto waiting lighters, SBLT Charles Hicks, RANR and his 50 man detachment were evacuated from the Peninsula. The last ANZAC troops had left Anzac Cove at 0410 that morning. Commemoration: Efforts will be made to highlight this important but little known Naval involvement in the Gallipoli Campaign during speeches and addresses on Anzac Day 2015. Copyright © 2011-2015 Navy Victoria Network.